Everyone was so incredibly helpful with me getting my head wrapped around this mystery. Thank you to everyone that emailed me, commented or posted on the list-serve in answer to screams and whimpers for help. I was given information to read, and I had already done my google searches for images – but wasn’t trusting my instinct. I decided to trust my instincts finally. I’ve always have a good sense for colours – balancing between complimentary and harmonious colours. Of course laying my whole stash out almost did more harm than good, but I frittered it down to small prints and what colours I want to use and it should fall into place. It generally does. 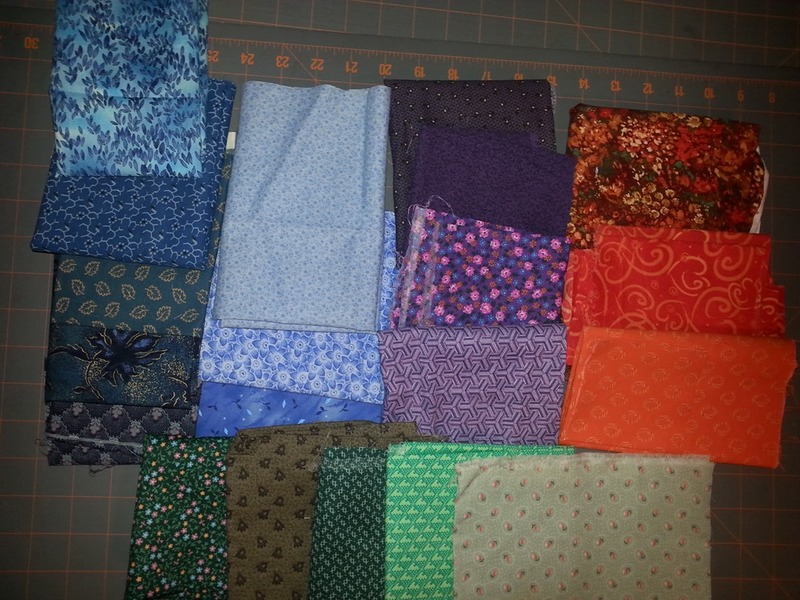 The pic on the left shows the fabrics that I’ll use for the background colour – the one on the right is without. I’m not likely to use all those prints in my blocks, but I have the option to use whatever ones I want and that’s all that matters. Not sure what’s happening with my camera lately, but my shots aren’t turning out as well as they used to. 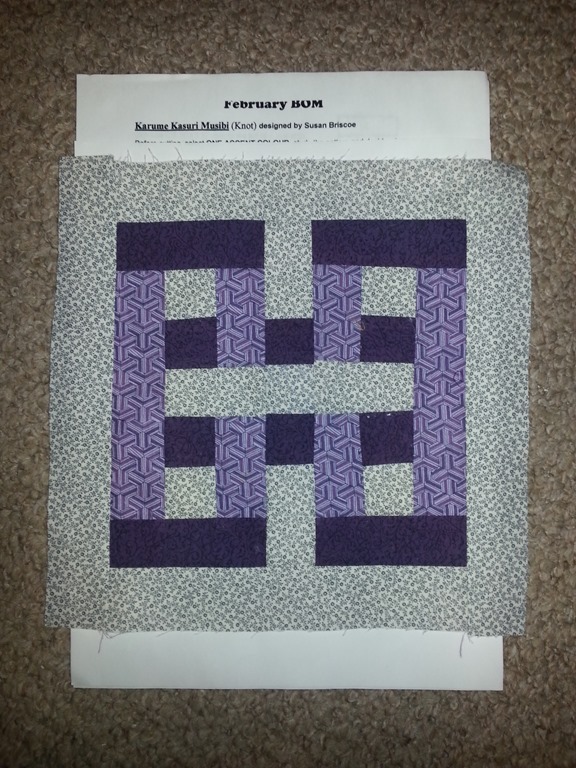 I opted to use purples oranges and greens for the blocks. For the months where I need 3 colours, I’ll use different hues of the same colour. With this being 12 blocks I should have more than enough for some pretty cool colour balance. 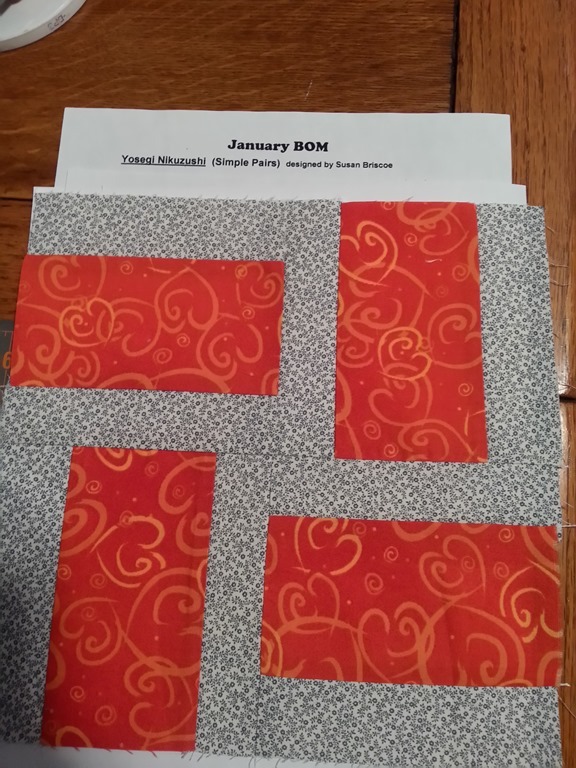 I know the orange I used for the January blocks isn’t necessarily small sprints but the whimsical hearts spoke to me and it is at least medium even if it’s tone on tone and there’s even enough for another block. 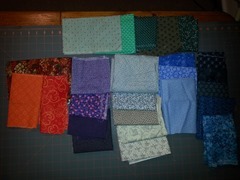 And the purples aren’t either – but they are fun fabrics and they spoke to and I think they look awesome together. Looking forward to see what the following months will reveal. Even the layout will be fun – straight? point on point? diagonal? yup .. I am going to have fun with this for sure! « 12 hours later .. This looks like something I can ‘kit up’ and take to retreat with me. Anyway, I’ve kinda been on a black&white kick this year, if the projects strewn about my sewing room are any indication.